The Secret of Dreadwillow Carse is out Tuesday, April 19, 2016! The Secret of Dreadwillow Carse by Brian Farrey. Algonquin Young Readers, 2016. 256 pages. Paperback/softcover. While perusing my Goodreads shelf for this year, I realized I have read quite a few younger-aged aimed books this year - and that I have been enjoying it immensely. These books aren't just fun to read, they are also extremely well-crafted stories that handle a variety of difficult topics in a way that younger audiences can understand. The most interesting aspect in each of these books, however, is that they seem to have messages for all ages and can be easily enjoyed by adults as well as younger kids. 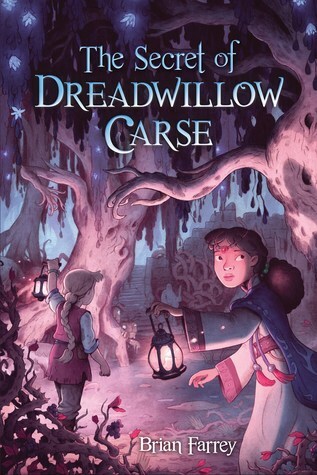 The Secret of Dreadwillow Carse is an exciting fairytale that unfolds itself in a variety of delightful layers as the story progresses. It covers a variety of heavy topics in imaginative ways with such a deft hand that I am simply in awe of Farrey. The story focuses on Aon, a girl living in the town of Emberfell, and Jeniah, the princess of the land who is soon to become queen as her mother passes on. Everyone in Emberfell is happy. If someone dies or goes away, that person is basically forgotten about so as not to have any sadness regarding their loss. Sad things do not happen and there is no crying because everything is happy. This sounds like it could possibly be a good thing, but it also sounds, quite frankly, creepy. Aon, however, does feel sadness, which thus makes her feel like an outcast and that something within her is 'broken.' I assume the author intended to use this as a metaphor for depression, but even if he didn't, I think it works itself into the storyline extremely well. While awareness for depression is increasing in the media, it is still somewhat of a taboo in certain families and culture, which makes those that do experience such negative feelings feel like there is something wrong with them. I felt that Aon's struggle with feeling differently than the rest of her town shed an interesting light on how experiencing different moods or emotions than what others think of as 'normal' can really make you feel alienated. I think this book does a good job showing that feeling differently from others is not wrong, but is instead normal and it is important to talk to others about these topics. Jeniah, on the other hand, is largely separated from the town (until she goes to explore the Carse and meets Aon) and struggles to come to terms with her impending status as queen. Jeniah does not feel that she is mature enough to yet be queen - which I actually find to be quite mature of her - and she struggles to come to terms with how to be responsible for an entire kingdom, as well deal with her newly appointed tutor that does nothing but frustrate her. Throughout the course of the story, Farrey subtly and expertly crafts Jeniah's character from an insecure and unaware girl into a more self-aware and knowledgeable young woman. Farrey's writing style is very accessible and a joy to read. It is not written in an overly simplistic manner, nor is it too advanced. His words flow smoothly, and there are moments of true beauty within his writing. I feel as though every kid - or adult - should read this at some point because of the important topics it covers and for its reminders that it's okay to be sad, it's okay to be inexperienced, and it's okay to not always have the answers. As a result, I am giving The Secret of Dreadwillow Carse five stars!